Audrey: Where is the pasta?? I've been WAITING FOR HOURS!!! Molly to Audrey: I KNOW!! Where is THE PASTA???? Audrey and Molly to Me: WHERE IS THE PASTA???? Me: It's on your plate and you've only been waiting for TEN MINUTES! I lie to my kids, all the time. I must come from a long line of kid liars because I have stories of all the lies my mom and dad would tell me. We talk about these lies and LAUGH, LAUGH, LAUGH. We laugh because these are lies that, as a grown up, would make you grin. Like, when I was a kid and we got fireworks I couldn't stop touching them. My dad told me that if you shake fireworks too much, they will become duds and not work. So I never touched them again. I was so afraid of having a duddy 4th of July. Before dinner time, if I was hungry and begged for a banana sitting on the counter, my mom would tell me that the banana wouldn't fit in my tummy because it was too big. She would hold it up to my tummy and show me how much bigger that banana was with a sad face. I would "aw shucks" and run off to play. One of my favorite lies was not even told to me or my brother. We were on a fishing trip and had caught a lot of fish. My dad and I were outside cleaning the fish when this kid came walking up asking all sorts of questions. I think my dad was getting tired of all the yapping. The kid asked my dad what kind of bait we used to catch all those fish and my dad answered, "Dry leaves, and let me tell you, it sure was hard keeping those leaves dry under the water." The kid ran off shouting to his dad, "Dad!!! They caught all those fish with DRY LEAVES!!" The kid's dad gave us the Stink Eye and took his kid back into the cabin. My dad and I couldn't stop laughing. I think I was 7. So, here I am with my own kids lying like a rug. I'll tell one of the girls to stop touching something because it will "blow up in your face". Or the other day I told Molly that if she didn't let me change her diaper her but would fall off and that HURTS! Emily's fish died the other day. Jeremy ran to the pet store to get replacements but they looked a little different than the originals. We suspected the fish died from Emily over feeding them so when she returned home from school we told her that when you overfeed your fish they change how they look. We also told her that if it happens a second time they could get really sick so STOP OVERFEEDING THE FISH. Emily still believes that if she lies to me (how ironic, ha!) that her tongue will turn black. I tell the kids that they will get sucked down the drain if they don't get out of the tub before the water drains out (they only half believe that one). When Emily refused to poop in the toilet I told her that it would start to build up and come out of her mouth instead. If the kids are whining too much I tell them the whine monster will show up and growl at them. I make up stories all the time to get through the day without having to argue rational points to little children. I don't know if this would be frowned upon by others. Maybe, maybe not. I just know it works for me and hopefully, when the girls grow up we can LAUGH, LAUGH, LAUGH about all the lies I told them. A couple of weeks ago my dad was with Audrey and they were looking at a Christmas tree. My dad told Audrey that it was a beautiful tree. Audrey told him it wasn't beautiful because it wasn't pink. 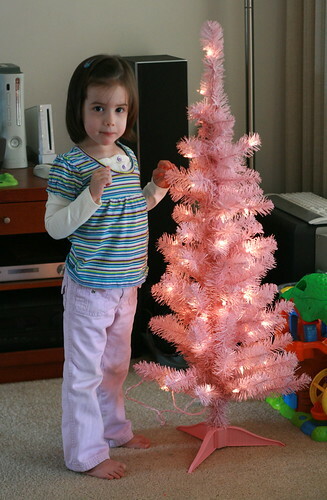 Yesterday my dad came by with a pink Christmas tree just for Audrey. Jeremy and I hid it from her and put it out in the living room last night for Audrey to find when she woke up. We spent Thanksgiving with my Aunt and Uncle this year. 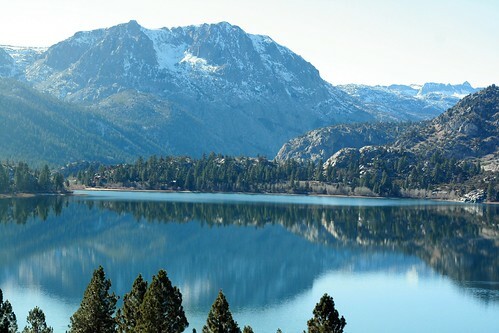 They live in a city close to Lake Tahoe. The girls did amazing on the ride up and back home. It took us 11 hours to get home on Saturday. My cousin was also there with his wife and 2 small children. It was really nice to see them. Emily loved their little girl. They were together the whole visit. Emily's little shadow. Audrey and Molly had a little bit harder time getting along with their cousins. I could see why there would be some conflicts. It was hard for me to get through because at home they get along pretty well for the most part. As soon as we were back home they were fine. Oh well, it is what it is. Luckily, my parents were there also, so my mom was able to help me out a lot. We all stayed in one room at my aunt's house. Since it was a new place I decided to sleep in the room while the girls fell asleep. I decided since there wasn't much else to do in the evenings I would just stay in bed. Going to bed at 8 p.m. is a trip. I would wake up at 2:30 a.m. and stare at the ceiling. That was probably the worst part about sharing a room. I couldn't get up and keep myself busy with a project in the middle of the night. I wish I had taken more pictures. Here is a video of Jeremy putting chains on my parents' car during our trip home. It was COLD. I was happy to have a chance to see snow fall though. This is a Flickr badge showing public photos from JenferCA. Make your own badge here.